Every Friday we get pizza for dinner, my break from cooking. 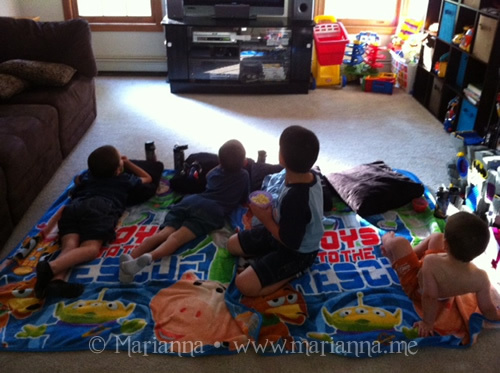 After dinner, we pop some popcorn and lay blankets on the floor for the boys so we can watch a movie together. 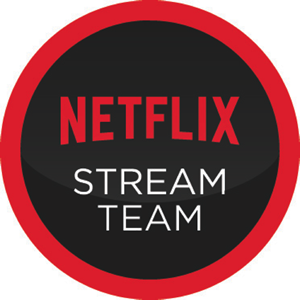 I have been trying to make the best of Netflix Streaming, so this past week we watched Jumanji. Not something we will watch again. A nice way to spend the evening! I have seen that Jumanji so many times that I don't think I could stand to ever watch it again -- once was enough for me! Hope your next movie night goes better! Friday night is our game/movie night too! We kinda do something similar. That's the Robin Williams one right? We do that quite a bit - not every week, but at least once a month. One of my favorite days! You didn't like Jumanji? I liked it! That is so awesome!! Love movie night! We do the same thing every week! But you didnt like Jumanji? Its one of our favorites. We watched that movie last summer. Kinda scary in parts. That's what I need to start doing. Movie nights on Friday. You always amaze me with 4 boys!!! We sometimes have a Friday family movie night too! I grew up on Family Movie night with pizza and popcorn! We are starting the same tradition with our girls.